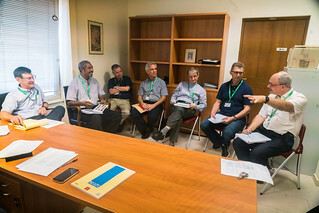 Before the first phase of the Congregation, and before the days of prayer and discernment that are called the murmurationes phase (an article on this subject will come out soon), the electors study the reports of different committees that have worked before the plenary session. 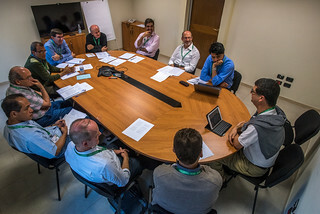 First of all there is the “De Statu” report, which must draw the portrait of the current state of the Society of Jesus. 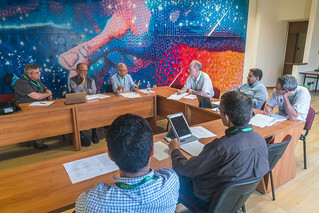 The other committees, which focus their attention on more specific aspects of the life and commitments of the Jesuits, will also have the chance to present a summary of their work. 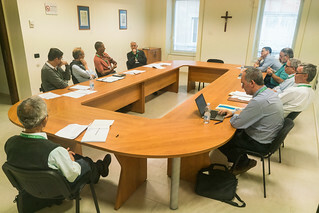 To foster mutual acquaintance among the electors and to help them in their discernment about which Jesuit could possibly become the next general superior, the Steering Committee suggested that several meetings in small groups be organized during these information days. The members of the GC will be organized into groups of about ten; there will be, then, twenty groups for each period of conversation. After each of these periods, the groups will be completely reshuffled and the next discussion will see everyone with new companions coming from diverse countries. This will be a big challenge for the logistical staff, directed by Fr. Arturo Sosa. First of all, they have to find 20 places good for small-group meetings and to make sure that each person quickly finds out where to go. But it is especially necessary to make sure that the greatest possible number of Jesuits meet each other in the different groups in which each takes part. Account must be taken of the languages understood and spoken. So, for example, certain Spanish-speaking Jesuits who understand English without expressing themselves in that language are put with Jesuits who speak English but who can understand Spanish.